Yesterday, after texting my boyfriend that I was going to make cauliflower pizza, he was skeptical. “I tried cauliflower on a pizza once,” he said. “It wasn’t very good.” It wasn’t until I sent a picture to him later of the finished product that I realized I hadn’t been clear about my newest experimental baking endeavor. I did not put cauliflower on top of my pizza; rather, the cauliflower kind of was my pizza. 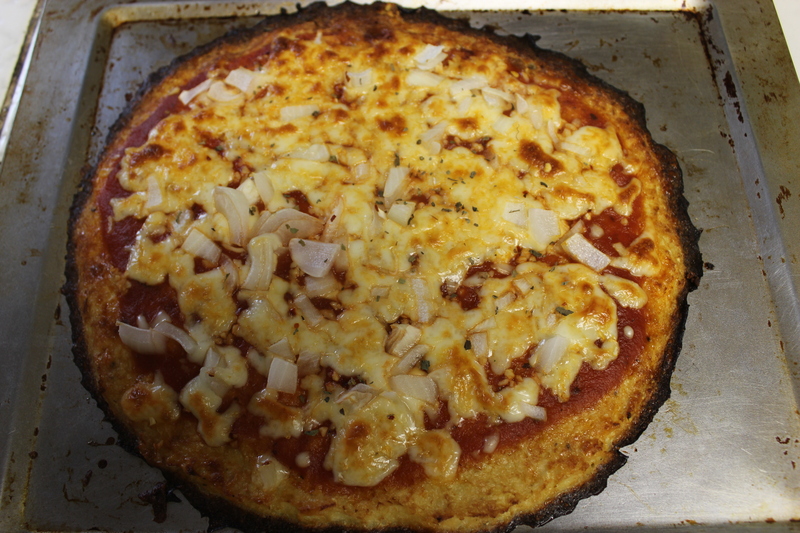 In other words, I used the cauliflower as the base for my crust as a low carb gluten-free alternative to pizza. Pretty cool, huh? Thanks to Pinterest, trying this recipe out has been on my to-do list for at least a year. I finally got the opportunity to take a swing at it when there was a huge head of cauliflower in the fridge on the verge of going bad. The recipe is sinfully simple, although it may be a bit time intensive. I highly recommend you give this a shot, though; you won’t be disappointed! 1. Grate your cauliflower. I used a regular old box grater (the same I use to grate mozzarella cheese) and it worked like a charm. 2. Chop your onion and grate your mozz cheese. I shouldn’t have to tell you this in a step, but what the heck. 3. Place the cauliflower crumbles into a bowl and microwave for 6-7 minutes or until warm and pliable. 4. Add a whipped up large egg and 1 cup of mozzarella cheese to the bowl. Add salt and pepper to taste. 5. Spray the oven tray, then place the mixture onto it. Form the crust (it should be about 10″). Be sure not to make it too thick because then it’s more likely for the middle to be softer when its done. The crispier the better! 6. Place in oven at 425 degrees for 10-15 minutes. Wait until the crust is browned on top. 7. Remove the crust, spread the sauce, add the garlic and red pepper flakes, then sprinkle cheese and onions on top. 8. Put it back into the oven for ten more minutes. 9. If you feel so inclined, sprinkle basil leaves on top. It’s not actually burnt! The crusts should look like that–nice and crispy.